It was 32 years ago, August 21st, 1983, that I witnessed a murder. I didn't actually see it, mind you. The gunshots. I was more an ear-witness than eyewitness. The victim was a 50-year-old politician named Benigno Aquino Jr. -- known to everyone in the Philippines by his nickname "Ninoy." His son Benigno Aquino III, known as "NoyNoy," is now in his final year as President of the Philippines. I was the last journalist to interview "Ninoy," before his death. 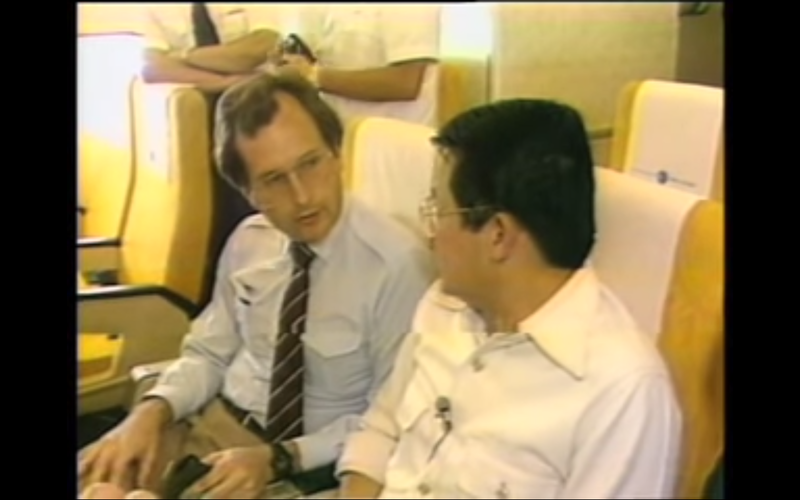 Just 45 minutes before the flight from Taipei landed at Manila Airport, Aquino told me: "If it is my fate to die by an assassin's bullet, so be it. But I cannot be petrified by inaction or fear. I cannot stay in a corner." Ninoy, what happened to him, and his political legacy are still much debated topics. They are also central to understanding an Asian nation of 7000 islands and 101 million people. A few years ago, I posted to YouTube my interview with Aquino and a recording of the final moments of his life. I am not sure what constitutes going viral, but in a short time the video views grew to half a million. Hundreds of comments by viewers -- some respectful, most profane have been posted. This week I received half a dozen. Many are written in Tagalog, the language most Filipinos speak. Netizens are not necessarily historians. I assume few know much about Ninoy. The average age of the population is 35. Young people populate cyberspace. Still, their comments reveal, if nothing else, passion. "Ninoy was a communist," wrote one, "and deserved what he got." "Marcos was a murderer," wrote another, "and the whole family should be punished." The truth of course was that Ferdinand Marcos, president from 1965 to 1986, saw Aquino as his greatest political opponent, labeled him a "communist sympathizer," put him in prison in 1972, and 7 years later when Aquino suffered a heart attack, allowed him to go into exile in the United States. The other truth is that we shall probably never know who ordered Aquino's assassination. 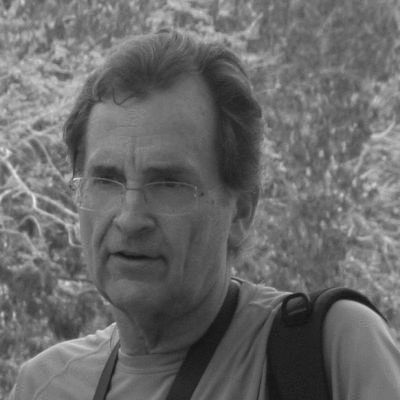 Marcos was ill at the time of the killing (recovering from a kidney transplant). Two men protected his power. His most trusted military commander, General Fabian Ver, was named in a judicial inquiry as one suspect behind a plot. Marcos crony and millionaire businessman Danding Cojuangco was also accused. Conspiracies could not be proven against either men. A total of 16 low ranking soldiers were imprisoned for involvement in the murder. Ninoy Aquino's attempt to return to the Philippines, against the advice of many who knew him, was born of political opportunism. He sensed that Marcos, who had assumed near dictatorial powers 11 years earlier, was weakening. Opposition was growing. Aquino tired of exile sought to lead that opposition. Ninoy's death marked the beginning of an era of political instability which arguably ended only in the last few years. The period saw the "yellow revolution," the fall of Marcos, the presidential election of Aquino's widow "Cory," and a succession of weak presidencies marred by corruption and nepotism. A longtime friend writes from Manila that today the Philippines has reached a long sought "period of stability and economic growth; looking better than Asian neighbors like Malaysia, Myanmar, and Thailand." My friend writes, "I have always been amazed how Aquino's widow and son stepped into his large shoes and while lacking much ambition or political skills delivered two of the more honest administrations in modern Philippine history." "Noynoy" also called "P-noy," elected president in 2010, could not be more unlike his father. The "Ninoy" I met exuded charisma. A fine speaker, I saw him as a clearly ambitious and calculating politician. "Noynoy" by contrast seems almost shy; devoid of magnetism. Yet according to the Social Weather Station, a social research group founded in Manila in 1985, "P-noy" is the most popular of the five presidents since Marcos. The Aquino legacy has resulted in identifiable progress in the Philippines. The economy chugs along with a six percent growth rate. My friend notes, "building adequate infrastructure to accommodate increasing economic growth rates" has been the greatest challenge of the presidency. "P-noy has done well in social infrastructure. Health care coverage now reaches 80% of the population. Spending on education had tripled. Raised cigarette taxes provide new funds for public health." P-noy's willingness to stand up to China in the South China Sea territorial dispute has also proved popular. Still the P-noy administration's efforts have put only a dent in the nation's intractable problem. A quarter of the nation (25 million people) remains mired in poverty, with families earning less than $5000 a year. Thirty-two years have passed. Events triggered by the Manila airport murder helped define a nation. As if yesterday, I recall the gun shots, shouts and confusion as I struggled to get from the aisle to a window to see the tarmac below. When I did, I saw a man in a white suit who I wished well moments before, face down, a geyser of blood spurting from his neck. Go back to the YouTube video to watch and listen. 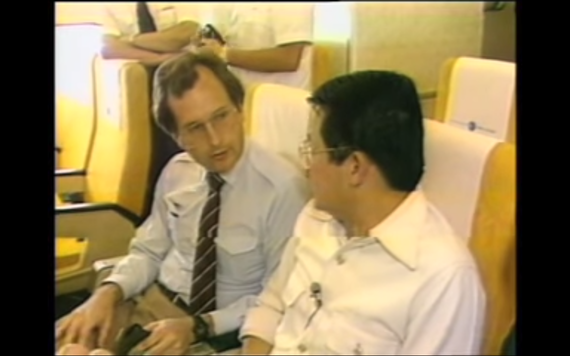 Less than ten seconds after Ninoy's head disappears through the airplane door, shots ring out. He must be still on the stairs. Aquino was gone. A martyr's legacy began.